New Delhi: Cover Story, the fast fashion brand owned by Kishore Biyani’s Future Style Lab, is aiming to generate ₹ 100 crore in sales in the ongoing financial year. With average sales per store of ₹ 25 lakh a year, the brand reported retail sales of ₹ 51 crore in FY18. The women’s western wear brand, launched in April 2016, targets consumers aged 22-40 years and differentiates itself from rivals H&M and Zara by designing clothes that suit an Indian woman’s body type. “We are looking to break even at the Ebitda level at the end of this fiscal year. We are growing at more than 100%, witnessing 12-30% like-for-like growth in our stores, indicating an increasing consumer base—consumers who are coming back to our stores," said Manjula Tiwari, chief executive of Future Style Labs. The company plans to open six new exclusive brand outlets (EBOs) this year in addition to the 50 shop-in-shop stores in multi-brand outlets such as Central and Shoppers Stop and 20 EBOs that the products are currently sold through. Cover Story has strategically opened its outlets across top malls in the country, often next to those of H&M, Vero Moda and Zara. The idea is to attract shoppers who prefer buying these international brands. Designed in London by Future Style Lab, the brand currently offers clothes and a limited collection of shoes and bags, which it plans to expand by April. The company also plans to sell jewellery and sunglasses. “Accessories are our core focus currently and since the branded jewellery market is underserved in India, we want to give a wide variety to our customers," said Tiwari. Apart from brick-and-mortar stores, Cover Story also sells through e-commerce websites such as Myntra, Jabong, Koovs and the brand’s own website. “Currently 7-8% of our overall sales are coming from e-commerce platforms and we expect it to reach 20% of our overall revenue in the next five years," she added. Cover Story currently makes its products in India, China and Sri Lanka. It’s also looking to source products from Turkey and Morocco. Tight control over supply chain and inventory, along with product decisions based on consumer data, are spurring the brand’s growth. “Other brands are struggling to manage their inventory and that is where we score," Tiwari said. “Our sales are more contained and happen twice a year (at the end of summer and winter). We do not go crazy with discounts. The average discount we offer is 35%," she said. 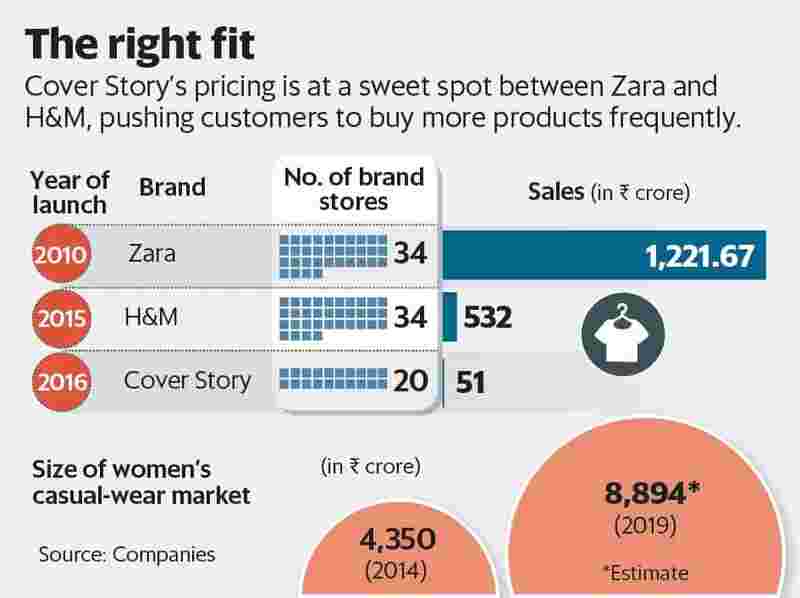 Cover Story’s pricing is a sweet spot between Zara and H&M, pushing customers to buy more products frequently. Priced between ₹ 790 and ₹ 4,000, the average product price stands at ₹ 1,700. Typically, the average cart size at a Cover Story store is two to three products, amounting to ₹ 3,500. Market researcher Technopak estimates women’s casual wear market size to touch ₹ 8,894 crore in 2019. Ankur Bisen, senior vice-president of retail and consumer products at Technopak, said that almost all fast fashion brands are growing rapidly in India—Zara has clocked over ₹ 1,000 crore in sales, H&M India over ₹ 500 crore and Koovs ₹ 100 crore. These brands will, however, face socio-economic as well as cultural challenges beyond the top 20 cities, he said. “It would be a challenge for them to penetrate the smaller towns of the country. While a young college-goer can wear a skirt in Mumbai, I doubt the same holds true for a young girl in a small town," he added. The brand advertises on digital media and social media platforms such as Instagram and Facebook, where fashion-conscious consumers often look for styling tips. It also does in-mall promotions and direct consumer connect initiative with fashion blogger events. The brand also works with the stylists of top actors such as Priyanka Chopra and Anushka Sharma, where they often sport looks created from Cover Story products.